Budget airline, Cebu Pacific Air oftentimes offer domestic and international promo fare to travelers. Cebu Pacific sale tickets can be book and obtained via online booking or buying the tickets directly from Ticketing Offices. Cebu Pacific ticketing offices are in the different areas in the Philippines and even in international places. In our past write-ups, we have shared the Cebu Pacific Ticketing Offices in Metro Manila as well as the Ticketing Offices in the Visayas. We hope we have help our readers in these areas. 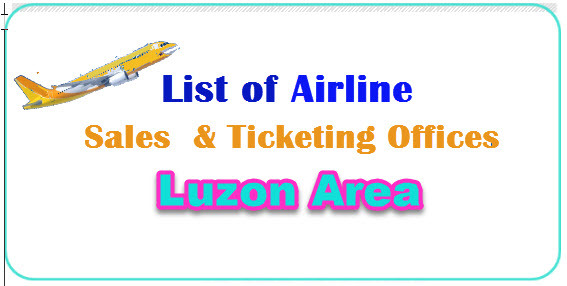 As for this post, we will be mentioning the Luzon Ticketing Office of Cebu Pacific Air for ready reference when you need to buy Cebu Pacific regular or promo tickets. For more inquiries, you may call the Cebu Pacific Air hotline number at (02) 70-20-888. You can also book your regular or promo tickets via phone but long distance charges apply. When the ticket offices are far from your place, you can always book online which can easily be done if you have internet connection. Just log on to www.cebupacificair.com. Most of the Cebu Pacific promos nowadays have no Promo Code. Cebu Pacific Promotion Code or promo codes may be required on special promos. Rest assured we will include in our posts the promo codes if necessary. In the experience of our PISO FARE team, booking online is the fastest way to get the Cebu Pacific promo fare seats. Sale tickets have limited availability and you must book fast to get the cheapest available fare. Check the CEBU PACIFIC ONLINE BOOKING GUIDE when you need info on how to book online. Like and Follow us on Facebook at PISO FARE Tickets for more booking tips, travel advisory and PISO FARE 2017 to 2018 alerts from Cebu Pacific Air, Philippine Airlines and PAL Express, Tiger Air, Air Asia Zest, Skyjet Airlines and travel updates!